What a huge weekend........and the prom was just gorgeous.....I was so proud of Brent and Alex..they looked absolutley stunning together. As usual in our house..it was a huge rush. 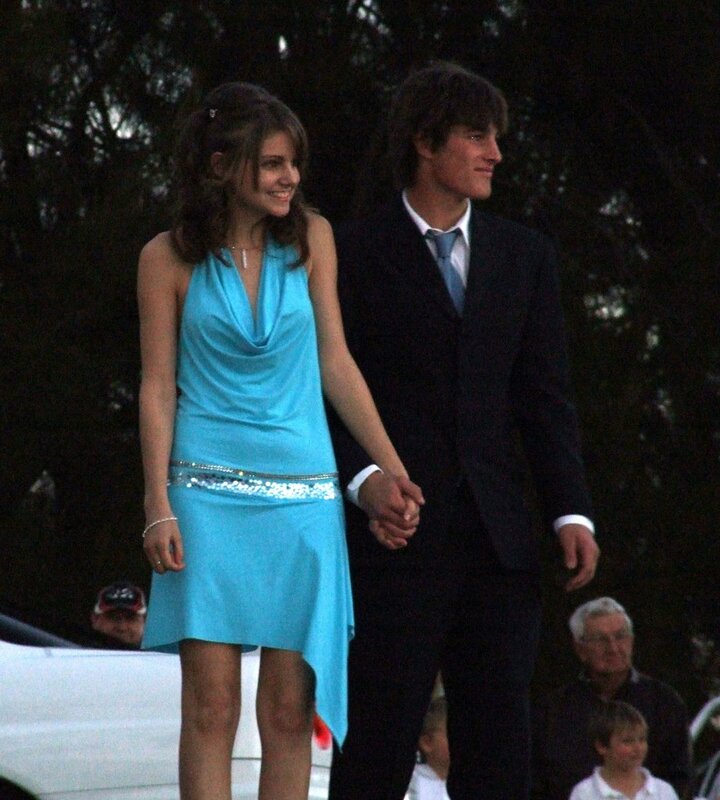 Brent played footy and then leisurely had his 40 min shower Grrrr(and yes I know we are on water restrictions)...he then wrapped a towel around his waist and plonked down to play PS2......Alex rushes in after having her hair and makeup done...and does her nails. To cut a long nagging story short.....the driver of his car arrives to pick him up...and he is not dressed and his hair is not done....and Alex isnt even home in Waikeire to be picked up yet.....I dont think Ive ever seen two teenagers rush so much. Brent was so excited about the car he had organised....it was a Skyline and apparently it is just an awesome car.....the sound of it squealing up the road with Brent in it as he left......wasnt very awesome to me but was without a doubt the highlight of the prom, according to Brent.....Yikes! Bummer Brents eyes are looking in the right direction...but I think their smiles tell it all. 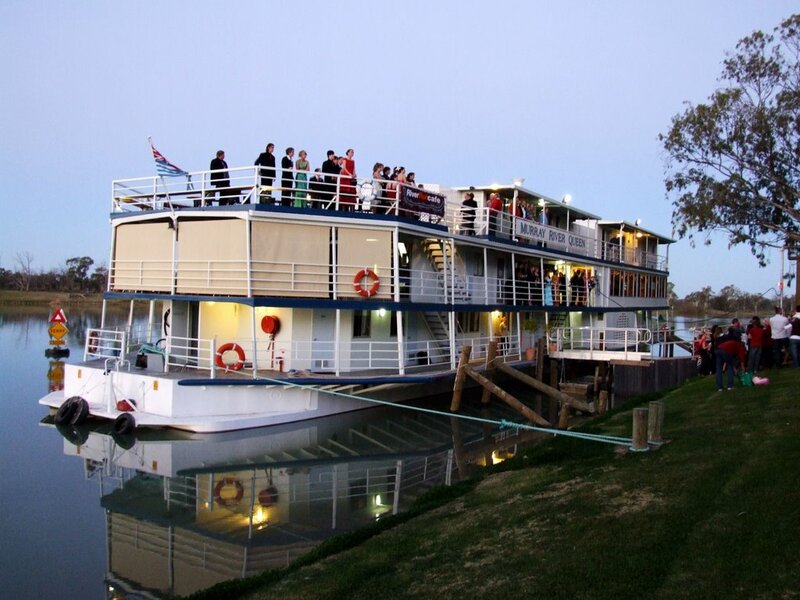 The prom was held on the 'Murray River Queen' and all of the couples looked stunning as they arrived and then walked the red carpet up the gangplank and onto the River Queen. The weather was superb and luckily Brent and Alex arrived in day light ...because my photos are not very good due to the distance away...let alone if it had been dark as well. 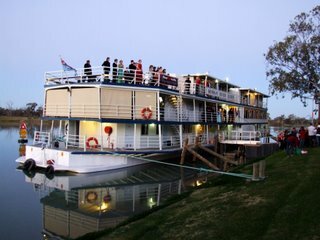 We waved goodbye to them on the boat at about 7.30 pm and then headed back to Bordertown for my SIL (Jo's) birthday.....we arrived at about 10.00pm....and joined in with the party. I was just glad the next morning when everyone was nursing sore heads...that we had arrived late and felt fit as fiddles. On Sunday we celebrated Evie's first birthday...she is the most gorgeous little girl....a real blessing to our family. Kelly as usual, had a scrumptious meal for us and the hoard of kids had a great time catching up. I know Mum and Dad have been missing Evie and wondering how much she has grown...so here some photos especially for you. Firstly Evies cake...this is a work of art.....by Lachie. For those that dont know our family...Lachie is Evies littlest brother (aged 6)...and Lachie loves to cook (and does so very well)...he was very proud of this cake...as were we all.....and Evie loved it as well. This is lucky Mitch about to get a very juicy kiss form Evie ...and Mitch loving every minute. Lastly the very happy contented birthday girl......what a delightful bubba. What a full weekend you had! The photos are gorgeous. That one of the boat... something about it.... it just takes me in. I bet they had a great night! Gee, look at Evie..she is a cute little girl! Sounds like you've been a busy girl! Hopefully you'll have a few days off of work to relax. Thought I would just pop in and say hi. Your son looks very handsome and Alex is a gorgeous looking girl, they look like the had a great night. ive been looking forward to see these photos!stunning, stunning, stunning! so glad it all went well!! Just love the pics of your neice Evie. The cake looked just great. Glad that Brnt and Alex had fun at the prom too even if it was a made rush. What a great weekend you must have had! Brent and Alex looked gorgeous together didn't they? And the boat pic is just beautiful. Have a rest now you deserve it.